We are pleased to announce a partnership with Corporate Casuals where you may order many types of clothing and other items with an embroidered IOU logo. Simply go to their storefront set up exclusively for the IOU, create an account if you are a new customer, select the item you want to order, select the logo you want to have embroidered, and complete your order. The following items are currently available for purchase from the IOU. Add them to your cart from the table below and send your order. 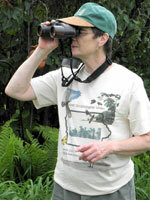 Printed on card stock for use in the field; save by buying 25 at a time! Sold at meetings for $.25/ea. Also available in bundle of 50 for $11.00 and bundle of 100 for $20.00. 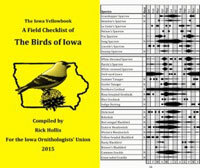 Two pocket-sized checklists (one for you and one for a friend) of Iowa birds with indicators of nesting and seasonal status. Bulk discounts available for 25+, please inquire. FREE TO NEW MEMBERS! Eggshell t-shirt with Iowa birds. Clearance sale price! Click on an item to add it to your order. If you want to order more than one of an item, just select it again. Your order form will be created below this table where you will be able to delete mistakes if necessary. If you do not see your size or color listed, it is out of stock. Please allow some time for your order delivery. IOU merchandise is managed by one volunteer and sometimes life just gets in the way! You may use the contact form at the bottom of each web page to inquire about the status of your order.